According to Denmark's fashion forum the grievances that the fur lobby filed, regarding mainstream media coverage of conditions on Danish fur farms, were officially rejected just before the holiday season. 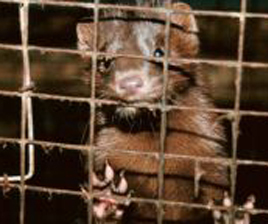 Almost exactly one year ago, Minister Eva Kjer Hansen of Denmark stated that "Mink breeders break animal welfare rules. And that is unacceptable," after the Danish newspaper Politiken published this article (Danish): Mink live under bad conditions in two out of three farms. That came after fox farming was outlawed in Denmark following a 2009 undercover investigation from the Danish animal rights organization, Anima. The investigation sent shock-waves through the Danish media, exposing horrible conditions on fur farms, and contradicting the multimillion-dollar marketing efforts of the fur industry and fur lobby groups like Kopenhagen Fur, which are headquartered in Denmark. As the fur industry continues to dispute all claims made by animal advocates in the EU, and has even filed official complaints about the press itself. It's important to point out that, while animal advocates have nothing to gain financially from documenting and exposing these farms, the fur industry stands to lose billions - so it's no surprise when they deny clearly documented facts. This is something of which the Danish government is well aware. The Danish TV station, TV2, recently did a follow-up on 2009's Operation X, and this wasn't to the liking of the Danish fur industry, so they filed a complaint with the Danish media board (Pressenævnet). According to politiken.dk the fur industry claimed that the images in the documentary were used in a misleading way to make matters worse then they are. They didn't get very far with their complaint and the media board rejected it. The animal rights group Anima's documentation is supported by the government. It seems our politicians could learn a lot from the Danish!